Baby Born With 8 Teeth! Home » Baby Born With 8 Teeth! 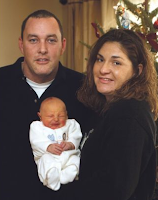 When Michael Matthew Mintz arrived on Dec. 5, he came with something not many other babies have when they’re born. “He was 7 lbs. 13 oz., 21 inches long with a mouth full of chompers,” said his father Keith Mintz. The proud papa, who was not fazed, then relayed the news to his family waiting outside the delivery room. “I said, ‘He’s healthy, he’s here, he’s got teeth,'” Mintz said.